Info "Let this be a lesson to always floss!" 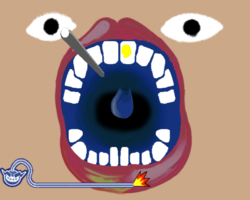 Budget Dentistry is one of Kat and Ana’s microgames in WarioWare: Smooth Moves. The player must aim the Wii Remote at the flashing spots on the person's teeth to fill them in. When the game is won, flowers will fly out of the throat. 1st level difficulty: There is one filling. 2nd level difficulty: There are two fillings. 3rd level difficulty: There are three fillings. This page was last edited on October 2, 2018, at 19:35.